At the Coach House the children use a free-flow system where the rooms are open to allow the children the opportunity to interact with all ages. We provide a stimulating child-initiated environment where they are free to make their own choices from resources stored at their level: this helps to develop friendships, imagination, negotiation skills and independence. Working alongside this, the key persons provide a variety of adult-planned activities based on their observation, next steps and again from the interests of the individual child. Key persons then take small groups of children at similar levels of development to do these planned activities. We follow the Letters & Sounds principles which is a national six-phase, high-quality teaching program. Early Years to Reception begins with phase one, which promotes listening and speaking. The Statutory Framework for the Early Years Foundation Stage sets out standards for learning, development and care for children from birth to five. Practitioners use the Social and Emotional Aspects of Development Guidance when looking at the stages of development of their key children and planning their next steps of development. There are seven areas of learning and development set out in the framework to shape the educational programme, Prime and Specific Areas. This is as in The Statutory Framework for the Early Years Foundation Stage; all areas of learning and development are important and inter-connected. The Three Prime areas are particularly crucial for igniting children’s curiosity and enthusiasm for learning, and for building their capacity to learn, from relationships and thrive). 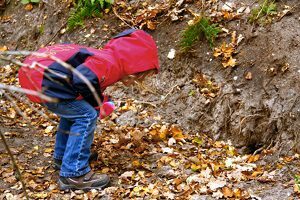 Practitioners support children in Nuthatches and Kingfishers to develop by focusing on the prime areas, which are the basis for successful learning in the other Four Specific areas, all seven will be then be the focus for the Robins and Woodpecker groups. a safe place to ride bikes and scooters, both areas provide a wonderful outdoor area to play and learn. 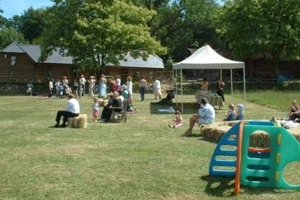 Not forgetting our vegetable patch where the childrew grow seasonal vegetables, used in our dinners or at snack-time. 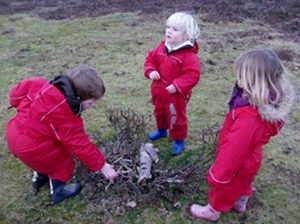 We use these areas as much as possible, rain or sun, as we believe that fresh air and outdoor play are very important in developing young children's physical and mental abilities. We have an open free flow system where the outside learning environment is accessible throughout the day so it is important for children to have suitable clothing for all weathers. 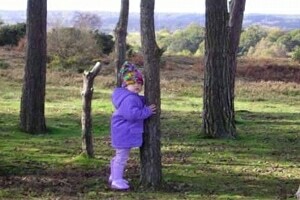 At the Coach House our emphasis is on exploring and having fun both inside and out. 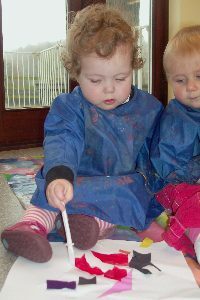 We do provide aprons for painting, however please make sure your child is wearing easily washable clothes which they don’t have to worry about. We do provide waterproof all-in-ones. We have a nursery bag that can be purchased from the manager. Please make sure that all clothes are clearly marked. 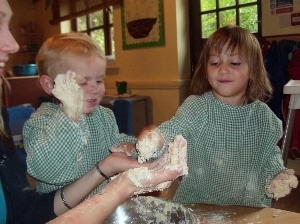 For all children joining the nursery our initial emphasis is on making your child feel happy and secure. To assist in this process each child is allocated a member of staff called a Key Person, who will form a special relationship with the child and his or her parents. We encourage parents to book a couple of settling sessions for their child prior to starting at our nursery. These settling in sessions are very individual and are made depending on the needs of each child they are normally held between 10am–12 noon or 2–4pm. These sessions should be booked with the Nursery Manager. We do advise parents to leave their child promptly to let the settling process begin.